That’s all Westley would ever say. But it meant so much more. In the film, The Princess Bride, Westley starts out as a farm boy working for Buttercup’s family and those three words were all he ever said to Buttercup. “As you wish.” She would ask him to do the most menial tasks like cleaning the stable or polishing her saddle or fetching her some odd thing and he would simply say to her, “As you wish.” But as the narrator tells us, what he was really saying was, “I love you.” If you say those three words to any fan of The Princess Bride they will know EXACTLY what you mean. But it isn’t some secret code. He wasn’t actually using the words “I love you” and Buttercup just heard it as something else. His words, “As you wish,” was a submission to her wants and needs and it was that act of giving yourself completely to someone that won her heart. Submission is such a dirty word. If you read the whole passage, Paul spends eight full verses on how husbands are supposed to honor their wives and treat them as the most precious thing in the world. Do you know how many verses he takes up talking about wives submitting to their husbands? Three. He has to use nearly three times as much space to tell the guys the same thing he says to the women in just a few verses. Maybe that says something about men’s capacity to understand? For whatever reason, Paul outlines for the guys what God expects and tells them they are supposed to treat their wives with the same kind of love and sacrifice as Christ did for all of humanity. That’s a pretty high standard to live up to but one which Paul felt women deserved. It’s what we all deserve in a committed, loving relationship – a partner who puts our needs, wants, hopes, and dreams above their own. Sacrifice is at the heart of love. All we have to do is look to Jesus to see that was true. Having the heart of a servant, being willing to submit to those you love, those are attributes Jesus exhibited time and time again. There was that moment when Jesus washed the feet of the disciples. The rest of them were probably confused, but Peter was near horrified. “You shall never wash my feet,” he told Jesus, but Jesus looked up at him and said, “Unless I wash you, you have no part of me.” Finally Peter relented and after Jesus washed their feet, he told them, “I have set you an example that you should do as I have done for you. 16 Very truly I tell you, no servant is greater than his master, nor is a messenger greater than the one who sent him. 17 Now that you know these things, you will be blessed if you do them.” Then there was the time when James and John asked Jesus if they could sit at his right and his left when he finally claimed his kingdom. Jesus told them that was a decision for God alone to decide. But just the audacity to ask the question made the other disciples mad and that’s when Jesus shared with them all this piece of wisdom. If we want to look for inspiration for how we should love one another, we only have to look to the cross and witness for ourselves the sacrifice that Christ made for us. He warns us how easily authority can be abused and when we submit ourselves before others, that’s exactly what we are doing – giving them authority over us and trusting that they will do what’s right. But as Jesus points out, so many don’t do what’s right. He talks about the rulers of the Gentiles and the high officials and how they love to boss people around and make them do what they want. 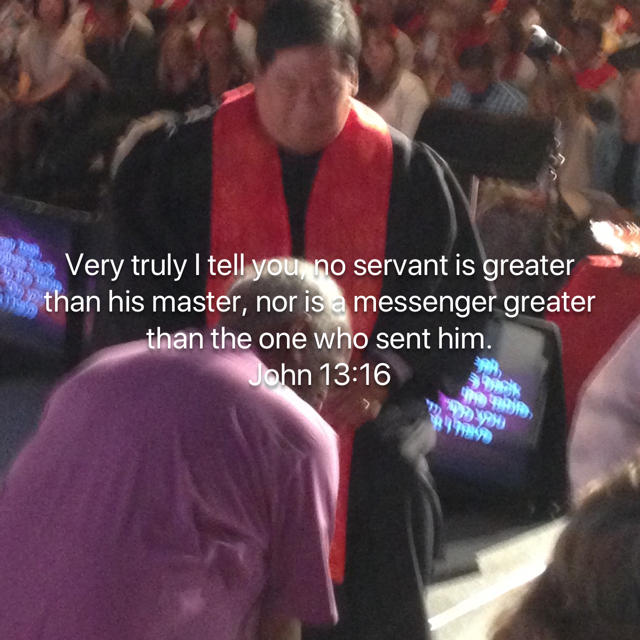 But Jesus said that to truly become great is not about who can dominate the most people. That’s just abusing the trust people place in you. Being great is about service and having a spirit of service to others. And that’s what it’s all about – serving others. But even in that we can be selfish. In The Princess Bride, Westley does whatever it is Buttercup wants him to do. Not what he FEELS like doing. He doesn’t say to her, “As you wish, except that. I don’t want to do that. What about something else?” He listens to her needs and follows through. But that’s not always easy for us to do. We have a hard time stepping out of our box and trying to see the world through someone else’s eyes. Like people who don’t like Star Wars. I don’t get that. I just don’t. Or worse. People who have never SEEN Star Wars! Gasp! Seriously, though, it isn’t always easy for us to do. Take for example the first and last time I bought Cassie flowers for Valentine’s Day (to be fair, I may have done it one other time in the 16 years we’ve been together but can’t say for sure). It was about 10 months after we had first started dating and I was SO in love with her. I was excited for our first Valentine’s Day together and I did what I thought I was supposed to do. I bought her a dozen red roses. I had them delivered to her work so that the WHOLE WORLD would know how much I loved her. That night she told me how beautiful they were, but said I didn’t need to buy her flowers to show how much I loved her, and I thought, “How sweet of her to say that.” I assumed she was just being humble because what woman doesn’t like getting a dozen red roses on Valentine’s Day? So a couple of weeks later, I brought her another dozen roses, just to show her I loved her not only on Valentine’s Day but EVERYDAY. She smiled, thanked me again, and told me again I didn’t have to do that. I thought, “What a woman! So humble and considerate!” So after the THIRD time I brought her flowers… she dropped the whole humble act and just spit it out. She looked at me and said, “Look, I wish you wouldn’t waste your money like that. I’d rather you saved that money for our honeymoon or our wedding instead of buying me something that’s going to wilt and die in a couple of days.” I didn’t know what to say! This is what you’re supposed to do, right? You buy a girl gifts, she melts in your arms, happily ever after. That’s what’s supposed to happen. It’s in some book somewhere. But what I didn’t realize was that wasn’t the way to Cassie’s heart. You can take the love language quiz right from the website! 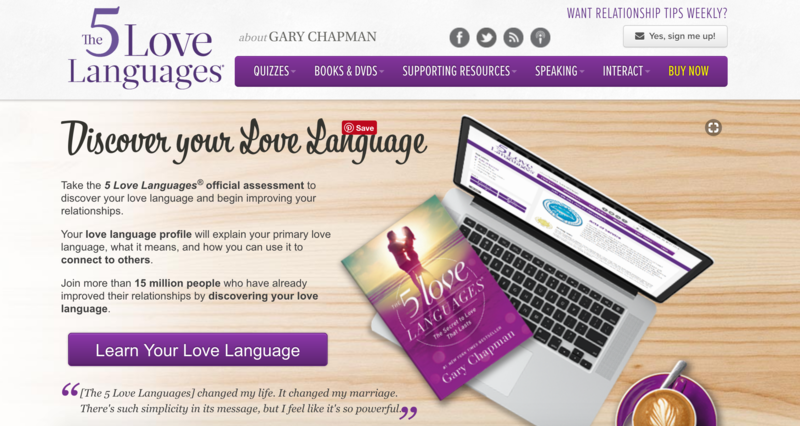 Gary Chapman wrote this great book called The 5 Love Languages which I’ve shared about in worship before and Cassie and I read it together in our Bible study group when we first started going to church together. In it, Gary describes how each of us react differently to love. We have different “love languages” and he categorized them as Words of Affirmation, Acts of Service, Physical Touch, Gift Giving, and Quality Time. Most of us have more than one, but there’s usually one or two that are on the top of our list and for me, “Gift Giving” was right near the top followed by “Physical Touch.” For Cassie, there was one language above all she connected with – “Acts of Service.” That was what filled her love tank and still does today. When I cooked dinner for her, helped her by mowing the lawn, take out the trash; when I DID things for her like that, she felt the most loved. Because for her, it was the self-sacrifice of my actions that expressed love to her and made her feel complete. Learning that she spoke a different love language really helped me to understand how best to communicate my love for her. I have to admit, there are times I forget and fall back on what feels good for me and I have to resist those temptations. But I try to speak her love language as much as possible. As we think about this season of love, maybe we can challenge ourselves to think of it in a new way. Or at least to remember that love means sacrifice. That submission doesn’t have to be a bad thing. And that when we love each other the way God intended it can be amazing. But it takes trust. I know that’s something that seems to be in short supply today, but trust like everything else is a choice. You can choose to live your life without trust and for sure you will be taken advantage of much less frequently. But don’t kid yourself. It will still happen. And the worst part is you’ll never feel quite at ease. Or you can choose to trust, knowing that at times your trust could be broken. But most of the time it won’t be and the life you lead you will see will have a profound difference in your life. It may never happen, but the more we work to creating a world based on trust and love, the better off all of humanity will be. If we become cynical and distrustful of the world, in the long run we will only poison the relationships we have. If I’ve learned anything from The Princess Bride it’s that true love wins out, and there is not truer love than that of God for us, his children. Trust at least in that and see where that leads you. In the name of the Father and of the Son and of the Holy Spirit. Amen.